My goodness this is a well done book. Justice League Dark 5 advances the overall storyline of the Tree of Wonder, but also further develops events from Witching Hour, and even follows up on the old Nightmaster series, despite the death of the character. And all of it is delivered with superb art. Sometimes horror art can come off as so beautiful, and that is certainly the case in this issue. The scenes in Myrra look great, as does John Constantine’s spellwork. The flashbacks to the funeral of Nightmaster contrast hugely, in terms of visuals, but once again are a demonstration of the talent of Daniel Sampere and Juan Alberran. I am always a sucker for Detective Chimp, and the character is handled particularly well in this issue. The death of Nightmaster hit Bobo hard, and in turn he has started hitting the bottle pretty hard. 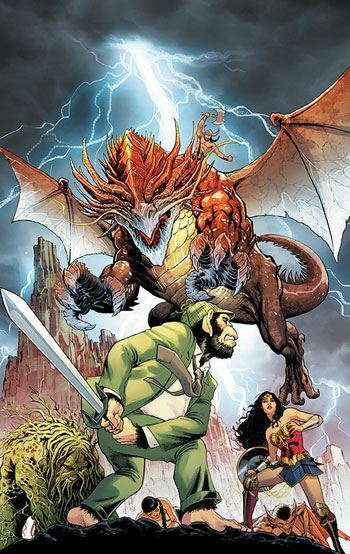 We had already been informed that Bobo inherited Nightmaster’s sword, but there is more of a connection between Detective Chimp and Myrra, which only starts to get revealed as this issue comes to a close. The story balances nicely. There is some weird comedic stuff with Man-Bat, and ominous moments with the Phantom Stranger and Dr Fate. I am so pleased with the way this book keeps itself open to the large cast of magical characters. Every issue has been packed with cameos, and brief scenes featuring heroes that are not core members of the team. DC has struggled over the years to keep a magical team in an ongoing book, and it looks like they have finally found the right formula, an inclusive one. Issue 5 marks five great issues in a row for this book. And it looks like the next one will be just as good.